Mick Elliott is back with ‘Squidge Dibley’; a hilarious new series he’s both written and illustrated. Launching in July, ‘Squidge Dibley’ is perfect for kids who love to laugh a lot and have a deep appreciation for anything dangerously disgusting. Grown-ups beware! Squidge Dibley is the new kid at Craglands South Primary School … and the school might not survive him. Things are going downhill fast for class 6PU at Craglands South. They’ve changed teachers more times than most kids change their socks, and their latest one is so strict they aren’t even allowed to sneeze. But just when it seems like the school term has been turned into a prison term, a new kid arrives. A kid unlike any other kid at Craglands South. A kid named Squidge Dibley. He’s small, quiet and strangely … squidgy. And he’s about to change everything! 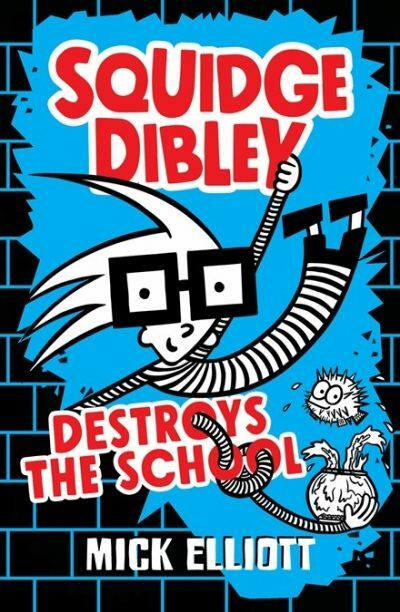 Squidge Dibley Destroys the School is out in July. Read the first two chapters online now here. 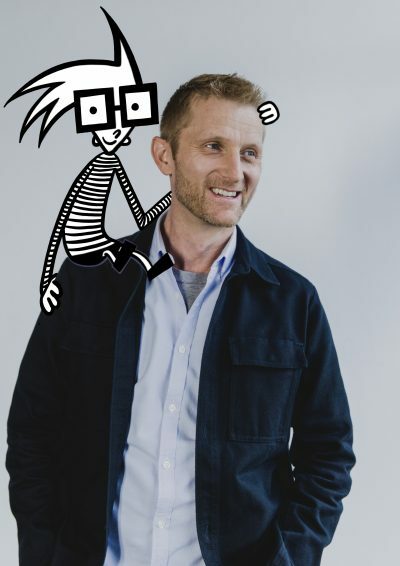 Known for putting kids at the heart of his work and his incredibly entertaining events—ultimately Mick’s passion is inspiring kids to read for pleasure. Here, Mick talks to his publisher Suzanne O’Sullivan about the series and what inspires him. You’ve talked about the importance of trying to see the world from a kids’ point of view in all your creative endeavours—where did this philosophy come from and why is it important to you? Kids are incredibly sophisticated. They will not tolerate being condescended to. One of the worst mistakes that anyone who writes for kids can make is thinking that you know what is good for them and taking an adult perspective. Kids will shut that down fast. I worked as a TV producer and scriptwriter at Nickelodeon for nearly 20 years and learnt a lot from their creative mantra, which is ‘kids first’. I learnt the importance of authenticity, heart and humour. If you write with these three elements at the forefront, then you create a platform into which you can explore complex themes. Taking a kid’s point of view also helps ensure that your characters are believable and that the way they react to what is going on around them feels genuine and engaging—even in a fantastic series like ‘Squidge Dibley’. Were you a big reader as a child and how have you tried to inspire a love of reading in your own kids? I grew up on Dr Seuss and Richard Scarry and Mr. Men. The first chapter book I read entirely on my own was The Magic Faraway Tree. I remember being so enthralled by the characters and proud of the fact I had read the whole book myself. So much so that I read it again immediately. I only discovered Wind in the Willows when it was on the school curriculum in year eight. I loved it—as much for E H Shepard’s illustrations as for Kenneth Grahame’s prose. In year 12 I played Rat in our annual pantomime, which was just a delight. My wife and I read to our kids every night. The power and benefits of being read to by parents can’t be underestimated. It is the most effective way to foster a love of books and increase their literacy. And it’s wonderful one-on-one time between a parent and child. You spend a lot of time visiting schools to talk about your books and reading—what’s the best part of doing these visits? School visits are one of the most joyous and exhilarating parts of being a children’s author. I love it! It is a privilege to witness the hard work being undertaken day-in-day-out by teachers/librarians all over Australia. They play such a critical role in getting books into kids’ hands and creating great spaces in every school that provide a resource for reading and research. I’ve been lucky to meet so many passionate booksellers while on speaking tours. Our bookselling community is vital in supporting Australian authors. But the best part has to be seeing how kids—even in this age of screens—will hang on every word when they are read a dynamic, engaging story. Plus I get the chance to perform—which is something I haven’t done so much since the run of Wind in the Willows back in year 12! How did you come up with the idea for Squidge Dibley? I used to get in trouble at school for drawing when I should have been writing. Even as an adult I would get chastised for doodling in the margins of my notebook during corporate meetings. So it was wonderful to have the opportunity to let my imagination run free in a fully illustrated series for primary-aged kids. The name Squidge Dibley came to me over breakfast with my wife one morning. Within a couple of minutes we had brainstormed the idea of a very special, incredibly quirky main character who accidentally comes to the rescue of a class who are at war with a horrible disciplinarian teacher. As a TV producer, I also witnessed the impact of screens on the way that kids consume content. YouTube, Minecraft and the thousands of other apps out there have created more directions for kids’ attention. As a kid’s book author, you need to be in tune with this shift and create stories that are immediately engaging, pacy and of course, full of humour and heart. Follow Mick on Instagram @whatmicksaw. Get your hands on an advance copy of Squidge Dibley Destroys the School! Email childrens.books@hachette.com.au with ‘Squidge Dibley’ in the subject line for your chance to secure one of five advance copies. Look out for book two in the series, coming in Spring 2019.